This photo of John Smith Chalmers was sent to me in 2001, by email from Elizabeth Thompson in NewZealand,who is a direct descendant. 116. 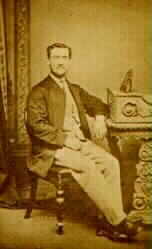 John Smith6 CHALMERS (James5, John4, Alexander3, James2, William1) (#232) was born Forgue parish, Aberdeenshire, Scotland 27 September 1846. (169) John died 15 August 1879 in Kaihiku Otago, New Zealand, at 32 years of age. (170) Report in the OTAGO WITNESS August 23rd 1879 "A railway accident occurred at Kaihiku, on the main Southern line,on the afternoon of Friday, the 15th, resulting fatally to the engine driver----though both the fireman and guard, who were the only other occupants of the train,escaped unhurt. The accident occurred to the goods train which leaves Clinton for Clarksville at 4pm. It had got to within about a mile from Kaihiku station on Friday afternoon, when the engine ran off the rails, down the embankment of about six feet, and rolled over some 30 yards distance from the line. No cause whatever, it is stated, can be assigned for the mishap. The train was of an average weight, comprising three loaded and five empty trucks; the engine was a new one; and the line at the spot was nearly straight. It is assumed, therefore, that there must have been some obstruction on the rails. When news of the accident was received in Dunedin, Messrs Grant and Armstrong left for the scene in a special, taking with them Dr Maunsell. The engine-driver, however, had died long before they arrived. He lived for six hours after the occurrence, and the doctor states that his injuries were so severe that no skill could have saved him. It would appear that the engine toppled over to the side on which he was standing, and that, having been thrown off it, he received his principal hurt from one of the trucks, the wheel of which struck him on the back and pinned him to the ground. The steam escaping from the engine blew into his face as he lay on the ground, and he was severely scalded by this means. The fireman and guard worked in a very praiseworthy way to release him, and had to use a crowbar to raise the wheel of the truck before he could be got out. The deceased, whose name was John Chalmers, was a resident of Lawrence,and leaves a wife and two children. He was taken to a settler's house near where the accident took place,and his body was afterwards taken to Clinton where an inquest was to be held. He was a man of thoroughly sober habits, a careful driver, and greatly respected amongst his fellows. " His body was interred after 15 August 1879 in Milton Otago, New Zealand. He married Emily MORTIMER in Tokomairo Otago, New Zealand, 6 April 1876. (Emily MORTIMER is #1424.) Emily was born in Duckponds Gelong, Victoria, Australia 14 September 1855. Emily died 27 March 1940 in Dunedin, New Zealand, at 84 years of age. He was baptized Forgue parish, Aberdeenshire, Scotland, 17 December 1846. Religion: Church of Scotland. He resided in Lawrence Otago, New Zealand 1876-1879. John's occupation: Railway Engineer in Lawrence Otago, New Zealand, 1876-1879.